Weep no more, dear readers, because the brilliant folks at KindleGraph have come up with a solution. I can now create personalized digital autographs for any reader, near or far, who would like to have one! Just go to my page on KindleGraph and let me know you want it, and I’ll whip something up just for you. No expensive travel to see me (especially since I can so rarely travel to make appearances to begin with…) and no waiting in lines! KindleGraph turns the inscription into collectible file you can download onto your own e-reader. So after re-doing a Branded Ann-and-Violet-on-the-island render for the new Moo Minicards I just ordered (so excited to get them!!) I then went a little overboard with the Daz-ing and started working on some fresh renders of the Branded Ann characters. You can see them on the Branded Ann 3D Characters page, but I’m going to blog them too because I’m just so happy with how they turned out! 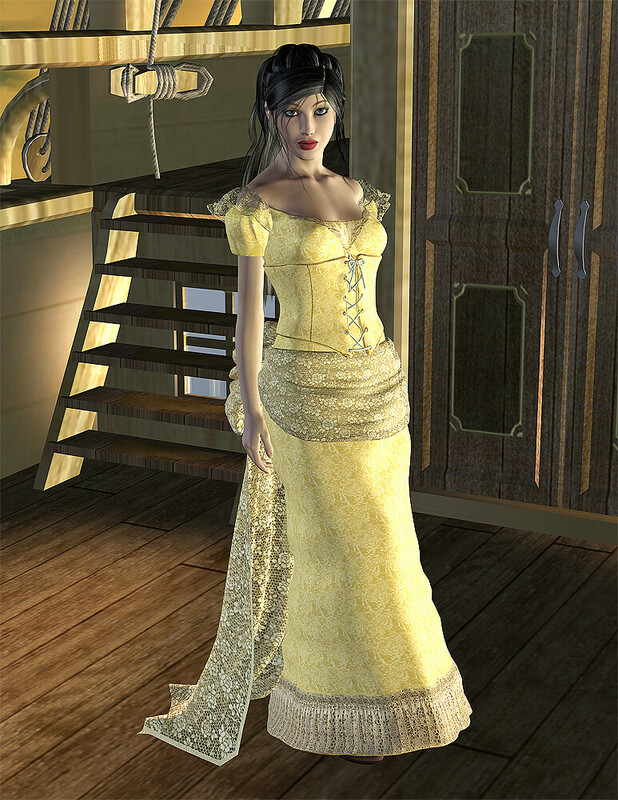 I started with some fun renders of Violet, and this one is probably my favorite; I wanted to see what she’d look like in an outfit similar to the ivory silk gown she’s given by the Spanish merchants (somewhere in chapter four or five, I believe.) HOT. With the three-day weekend I was able to squeeze in about five hours of writing time yesterday (luxury!!) and managed to get chapter 14 finished. It was a great chapter to write, too — full of highly emotional scenes and the first love scene of the novel, so I really wanted to take my time with it and do the scenes justice.